You can make 6 small, individual trifles or one large trifle! Either way you will have extra brownies to enjoy! Preheat oven to 350 degrees. Spray a large rimmed baking sheet with non-stick spray. Melt the butter, 1# of the chocolate chips and the bittersweet chocolate in a microwave on 30 second intervals. Stir until smooth and cool slightly. In a separate bowl, whisk together the eggs, espresso powder, vanilla bean paste and sugar. Whisk in the chocolate and butter mixture. In a small bowl, stir together 1 cup of the flour, baking powder and salt. Add this to the chocolate mixture. Toss the remaining 12oz of chocolate chips with the remaining ¼ cup of flour. Add this to the chocolate batter and stir to combine. Spread in the rimmed baking sheet and bake for 25 minutes. Allow to cool and refrigerate overnight. Cut into bite sized cubes. There will be leftovers for snacking! 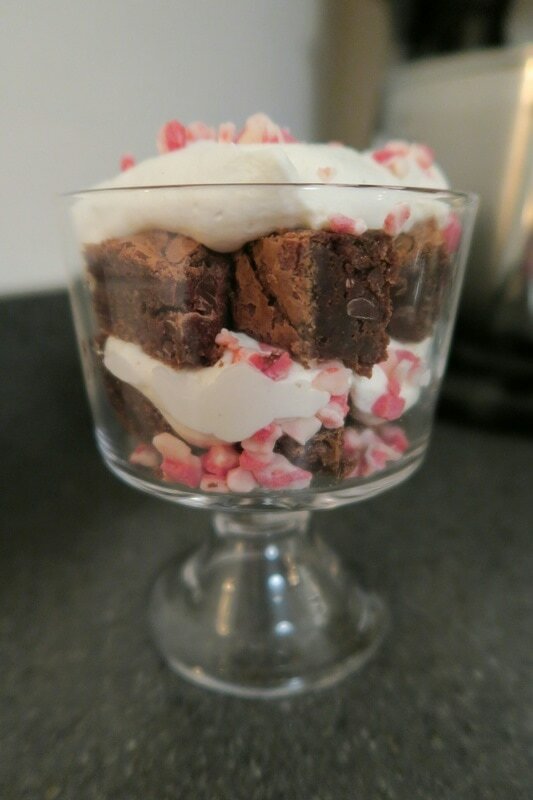 To assemble the trifles: Depending on the size of your trifle dishes, whether they are small individual ones or one large one, layer the espresso brownie cubes, then whipped cream, then a layer of Andes Peppermint Crunch Candies, layer again, and again if possible, finishing with the Peppermint Candies. You may need to make more whipped cream, depending on the size of your trifle dish. This whipped cream recipe is enough for 6 small trifles.